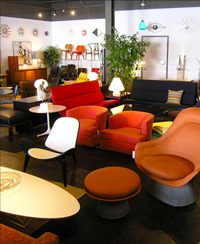 Machine Age is always looking to buy your mid-twentieth-century designer furniture and accessories by manufacturers such as Dunbar, Widdicomb, Knoll, B&B Italia, Saporiti, Herman Miller, Stendig, Louis Poulson, Curtis Jere, Cassina, Artek, Fritz Hansen, Niels Roth Andersen, Zanota, Vitra, Artemide, Poltronova, Montis, etc., and designers such as Hans Wegner, Finn Juhl, Milo Baughman, Jens Risom, Paul McCobb, George Nelson, Charles and Ray Eames, Edward Wormley, Harry Bertoia, Warren Platner, Mies van der Rohe, Paul Evans, T. H. Robsjohn-Gibbings, Florence Knoll, Alvar Aalto, Silas Seandel, Vladimir Kagan, and the like. Machine Age also specializes in props rental furniture and accessories for film, television, and photo shoots. Machine Age works with expert upholsterers to restore pieces to their original beauty. We use the finest Knoll and Maharam textiles and can help clients choose just the right fabric for their piece.